Knife throwing has been around for a long time. Just how long is unknown, but we do know that soldiers in the American Civil War used the sport to pass time in camp. It has endured the ages as an art, a sport, and an entertainment method. 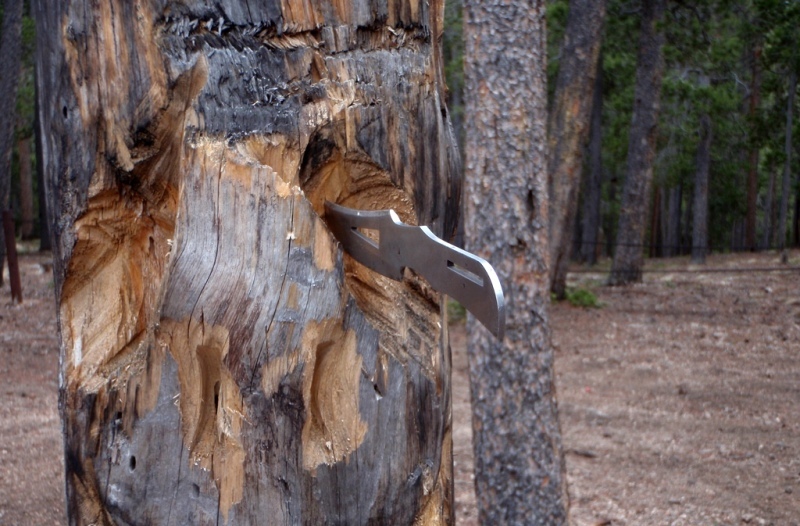 That being said, it’s important to know how to throw a throwing knife before giving it a try. The good news is that it is a fairly easy thing to learn. As a beginner, go for simple designs without embellishments (a good beginner knife is this set from Smith and Wesson). This will help you learn to throw more accurately and plain knives are easier to throw. 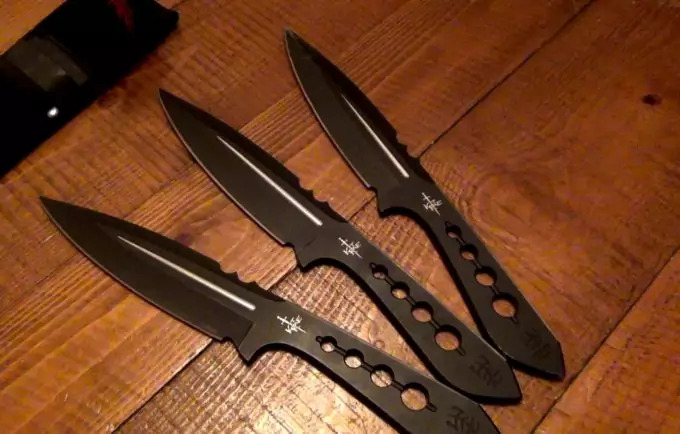 If there is not a shop near you that sells throwing knives, you can find plenty online at cheap prices in all shapes and sizes usually in groups of three. Keep in mind, as you choose your knives, that you are looking for something that possesses the proper weight, length, and appears that it will stick in your target when thrown. 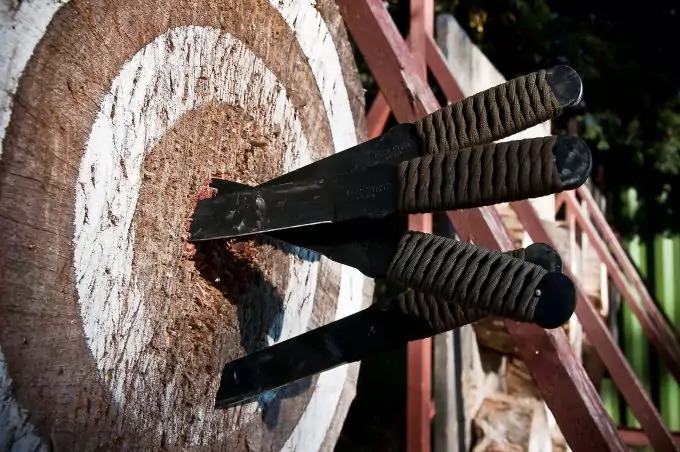 We have a great set of reviews in our article on the best throwing knives on the market, so don’t forget to check it out! Planks – Wood planks will work fine if that’s what you have laying around; the wider, the better. Lumber yards – Check with your local lumber yard and see if you can claim any log scraps they might normally throw away. Firewood dealers – Check classifieds for local sources of firewood. This can be a cheap, and sometimes free, solution. Friends – People cut down trees every day. You could be the answer to someone else’s problem. Best types of wood are soft woods like Cottonwood, Pine, or Poplar. Your knives will stick in them easier as the wood is soft. A knife will bounce off of hardwoods like Oak, and plywood which is why they are a bad choice unless you are using small knives. The most basic goals to knife throwing are accuracy and the stick. These goals can be perfected by adjusting your distance from the target and the throwing technique you choose to use. The next goal to strive for is consistency. Practice your techniques until you are accurate more times than not. Then you can try different techniques and knives to diversify your skills. Set your target away from houses, cars, gas grills, etc. Also, don’t forget to check our guidelines on knife safety that also include more details about throwing knives and safety regulations..
You are ready now to practice handling some knives so give it a try with this piece of jewelry from United Cutlery. 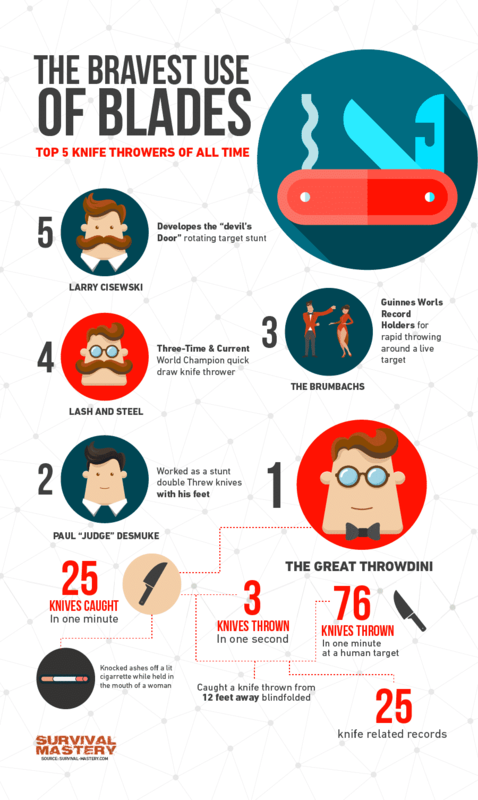 With many sports, there is a certain form to practice to be good and knife throwing is no exception. As you practice your stance, be mindful of your footing and your posture – this will help you understand knife throwing techniques more quickly. Try it out and get comfortable with your stance. Be loose and relaxed, but focused. You should try throwing a baseball at your target while practicing your stance until it feels natural. There are two ways to throw a knife: by the handle or by the blade and the technique is decided by the knife. Hold the knife and determine which end is the heaviest as you’ll want to throw the heavy end first to achieve more force going into your target. Once the grip end is determined, hold the knife with your index, middle, and ring finger with your thumb on the opposite side. Position your thumb and fingers in the center of the knife and near the end so that your pinky hangs off and just curls with your hand. If this grip doesn’t feel natural or work well for you, try some of the bellow variations while practicing your throwing. Hammer grip – Take the knife in a horizontal orientation. Grip it with your entire hand like you would the handle of a hammer. Rest your thumb in the center on the side. McEvoy grip – Take the knife in a vertical orientation. Grip it with your entire hand like a hammer and rest your thumb on the top edge. Pinch grip – Pinch the tip of the knife between your thumb and second knuckle of your index finger. Curl the rest of your hand into a fist-like grip. Slider grip – Position the knife in parallel with the palm of your hand as if it were an extension of your middle finger. Lay your thumb across it like you are making the number 4 with your hand to hold the knife in place. These variations change the dynamic of your throw, so pay attention to where your knives are going. Knife throwing is a situation of trial and error. It is not difficult to learn, but you must keep trying until you find what suits you best. Make one correction to your throw at a time until you achieve the desired result. 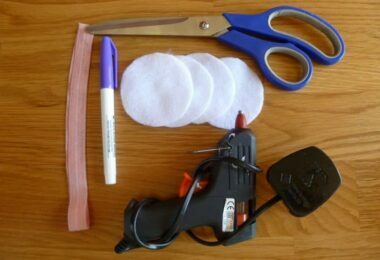 Here’s a tip to try if you are having trouble getting your knife to stick in your target and nothing else seems to be working. Imagine the rotation of your knife in the air. Throw it in such a way that the force of the rotation continues when the tip strikes the target. Imagine the tip sort of hooking into the target and embedding deeper in the wood. You will most likely need to alter your grip to accomplish this. Also, this will work best with a handle-grip knife. If your throw is strong, and you are sinking the tips of your knives deep into your target, then why not give the full-spin a try. As with the ¼ turn, you must adjust your distance from the target. This time, you will move in the opposite direction. For example, if you throw accurately from 12 feet on the half-spin throw, you need to double that for the full-spin so you are standing 24 feet from the target. However, there’s a twist. You must take the length of your arm into account on this throw, so back up an arm’s length in addition to doubling your normal distance. At this point, run through your normal throwing procedure until you hit the target accurately and you knife sticks consistently. As usual, you need to adjust the different variables accordingly. You can stretch it out as far as you like. Competition goes up to two spins if that’s something in which you’d like to participate. As with the full-spin throw, distance is your main variable with longer throws, followed by adjustments to your distance and throw strength. It’s suggested that you master the spins and physics of the throws before you try for competition distances which are quite short. Learning how to throw knives goes well beyond mastering your stance, grip, and various throws. Throwing axes and tomahawks also fits under the umbrella of knife throwing too. There have been several books written regarding the physics involved, and techniques. You will also find information online about making your own throwing knives from common steak knives if you are a do-it-yourself kind of person. 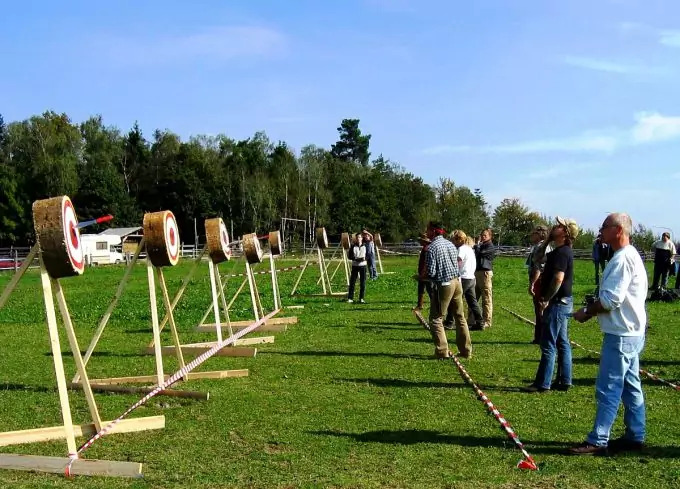 If competition throwing isn’t your thing, but performance is, you could be suited for the impalement arts which includes knife and axe throwing. Throw your knife to begin a fight. If you’re going in to take out a patrol or guard, have more than your knives. They will! All of these circumstances are ones that we hope never happen, but knowing how to throw a knife can be an added weapon in your arsenal just when you need it most. Still, when it comes to combat, it is best to have a survival knife on you as they are sturdy and can inflict a lot of damage. 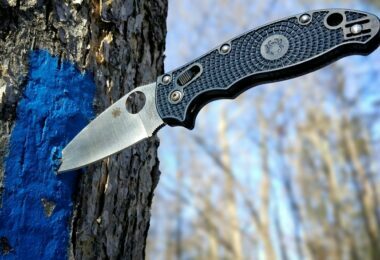 If you want to know more, take a look at these reviews on the best survival knives to have. Be careful! These are advanced techniques to help you hone your skills in not only knife throwing, but agility as well. These will require additional safety measures and you can learn more about them here, in this complete guide for throwing knives. 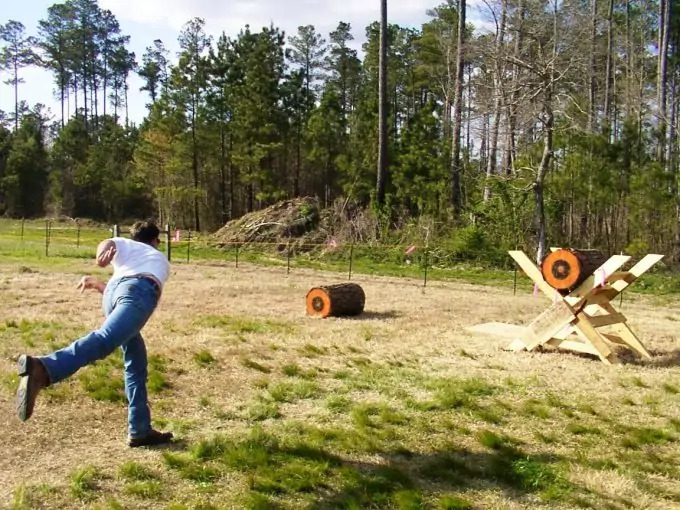 All-in-all, knife throwing is a great art and fun sport. It’s also great as nothing more than a backyard hobby. If you are considering taking up knife throwing, do your due diligence with training yourself and having the right equipment. Don’t rob yourself of taking the time to ensure the proper safety procedures. If you practice with friends, always make it an alcohol-free activity. 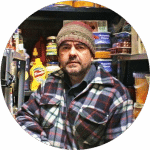 Having a hobby that translates to a survival skill might be convenient one day. Most of all, have a good time with it!